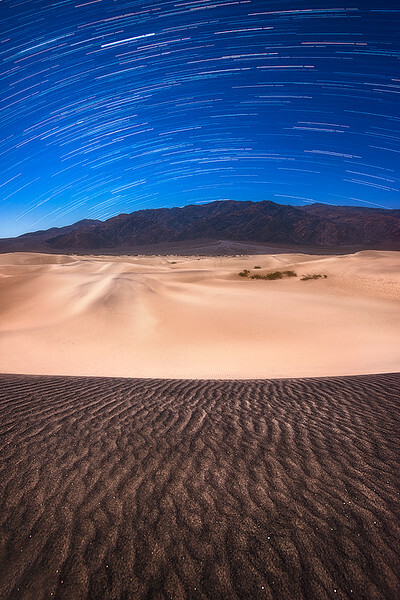 Hiking the sand dunes of Death Valley during twilight and at night is one of the best experiences I've ever had. No one is out there, there aren't any cars, lights or people in sight. The moon lights the entire landscape and it almost feels as though you're on the Moon or another planet all together. Although you don't really notice it with the naked eye, the moon light shimmers off of the small pieces of sand and sparkles when captured on camera. You can see this in the foreground of this photo. It really pops off the page when viewing the full size TIFF file. The sand formations and dunes change every day so it's always interesting seeing which new formations you'll find on any given sunrise, sunset or night shoot. This specific formation, like everything landscape photography related was a mix of luck & scouting earlier in the day. If you're interested in learning to take shots like this check out my "How to Create Star Trails the Easy Way Using Lightroom & Photoshop" video tutorial linked below!